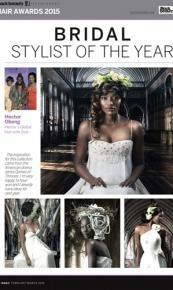 Hector Obeng Scoops the the The National Bridal Stylist of the yr for the 3rd concecutive time. " My theme was 'Game of Thrones'. Wanting to win this for the final year with an epic collection. It's a bitter sweet but a nice way to bow out of this catergory"
Check out Hector Obeng's collection in its full entirety on our gallery page.